The first iPhone went on sale on June 29, 2007, and 10 years on we're looking back with rose-tinted glasses to where our smartphone obsession began. It may have been flawed in several ways – the original iPhone didn't even have 3G support – but it started a trend which is still going strong now. 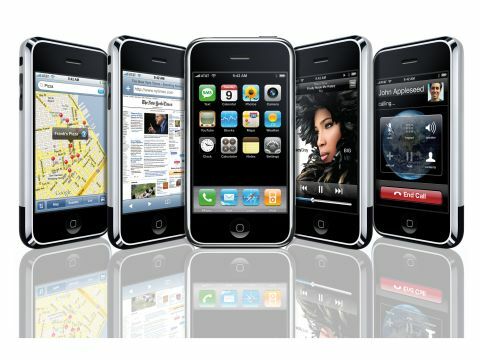 So take a moment to sit back and reminisce with us - the original iPhone shaped the smartphone you now hold in your hand. Not many devices can lay claim to such a huge achievement. The first feature that exemplifies the iPhone's excellence: Apple's MultiTouch touchscreen technology. MultiTouch will prove to be a model for touchface interfaces in the future. MultiTouch succeeds because it uses natural movements: a pinching motion for zooming in and out, a flick up or down for fast scrolling, single and double taps. MultiTouch avoids awkward movements. iPhone management is done through a USB connection on Mac or Windows (the iPhone is incompatible with 64-bit Windows Vista ) using iTunes . Not only are your iPod files organised in iTunes, but you also determine your Calendar and Address Book settings there, too. The iPhone is compatible with Address Book, iCal under Mac OS X , and Microsoft Entourage on the Mac. On Windows, iPhone works with Microsoft Outlook. However, load a site that requires plug-ins such as Adobe Flash , and you see missing plug-in messages. Apple won't comment on why the iPhone's Safari browser is crippled this way, but perhaps AT&T 's EDGE network isn't fast enough for streaming media. Supported email services include Yahoo , Google Mail, .Mac , and AOL . You can also enter settings for IMAP, POP, and Microsoft Exchange (IMAP only, and the Exchange server must have update Rollup 3 installed). You can view HTML emails, but you can't mark emails as spam. We were able to set up accounts quickly, but we did have some performance lag while typing email messages. Underneath the iPhone software is Mac OS X, and the iPhone feel like it has the power of a super sub-compact Mac. Unlike the MacBook and other Macs, the iPhone doesn't use an Intel processor. It uses a Samsung -manufactured ARM chip and it has 512MB of SDRAM to run the OS. The ARM processor is quite snappy; you can zip through the iPhone interface without any delays. Some tasks, such as opening email attachments and Cover Flow, feel faster than on an Intel 2GHz Core 2 Duo MacBook.